When you buy an apartment in Spain you will be paying towards what is known as community insurance. You can’t choose not to pay this because it will be part of your community fees. What you really need to make sure, is whether this cover is sufficient or whether you should take out extra coverage to protect yourself. What are Community Fees in Spain? Well as apartment blocks have multiple owners and have common areas, each block has what is called a community. As a owner of an apartment you will usually have one vote as do the other residents. A president and board is appointed by a vote. The board usually then appoint a management company to handle the administration and running of the apartment block. For example a company need to be appointed to cut the lawns and tend to the gardens. A company need to be appointed to maintain and clean the swimming pool. The president and board are meant to be independent and choose the best tender for the contract and not choose any company through vested or personal interests. All the costs of running and maintaining the apartment block are divided by the number of residents and this is the community fee which you pay monthly or annually. Part of the community fee goes towards what is known as the community buildings insurance. Under Spanish law each community/urbanisation has to have a minimum amount of insurance to cover buildings insurance, public liability and insurance against water damage. It is obviously important that the apartment complex block is insured. 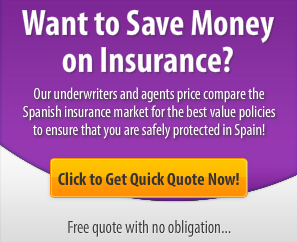 What Does Spanish Community Insurance Cover? The community insurance in general covers the outside or external part of the building. For example imagine if a fire breaks out in an apartment which destroys the whole block or part of it – the community insurance covers the costs to rebuild the apartment block. The public liability is also very important because in a large building accidents can and do happen. This insurance protects against legal action by third-parties. For example imagine that a visitor slips in the corridor and wants to sue or file a lawsuit – the community insurance will cover all the residents of the community (apartment). The community water damage insurance covers the community pipes which of course run all through the building. If one of these pipes burst then any damage will be covered by the associations/community policy. What you should know is what you are NOT insured and covered for. Do not assume your community fee which in turn covers the community buildings insurance is covering you for everything and that additional insurance is not necessary. Certainly your personal possessions such as furniture, jewellery, electrical items etc are not covered and this must be protected under home contents insurance. In addition if a neighbour causes a flood which damages your apartment this typically will not be covered under the community insurance (except if the flood was caused by a community pipe). A possibility for this is they are running the bath water and forget it is running and it overflows into your apartment underneath. Most people who live in an apartment in Spain discover all too late that they are not adequately covered by their urbanisation’s community insurance policy. Remember that the community insurance will typically only cover the buildings structure, common areas and where specified, certain common furnishings like carpeting and decorative furnishings. Hi I wonder if you can answer me a question regarding community insurance. We have a property on a residential complex in Puerto Del Carmen Lanzarote. The complex is in a touristic area with 4 large hotels on the same street. Some of the owners break the law by letting their apartments to tourists for financial gain. As far as we can assertion we believe the existing insurance does not cover tourists in the case of and accident. We are worried that should an accident happen to a tourist our existing insurance will not pay a claim which could then have severe financial implications for all owners. My question is this: Is there an insurance cover available that would cover such an accident as we believe to get this type of insurance a touristic license is required and these are only issued to touristic complexes?